Marrying abroad is more popular than ever and Africa Collection is delighted to offer a comprehensive range of wedding and honeymoon options. We can deliver a unique and cost-effective day to remember at a hand-picked selection of locations and properties, for that perfect wedding in South Africa & the Indian Ocean. Share or celebrate your love for one another in the most spectacular surroundings, and let our team of knowledgeable staff indulge their passion for Southern Africa and the Indian Ocean to help you plan an unforgettable event. These have long been popular destinations for romantics. Imagine a ceremony at the top of Table Mountain, overlooking the 'Mother City' of Cape Town; or on a private game reserve with the magic of the African bush as a backdrop. Or you may prefer a tropical affair on a white sandy beach in Mauritius, or amongst the vineyards at one of South Africa's top wine estates. A typical wedding package will include the hotel accommodation; the Magistrate, ceremony and the legal documentation; all decor, flowers and a wedding cake; a complimentary bottle of sparkling wine. But the package can vary and we would be more than happy to tailor-make arrangements to meet your your individual requirements. 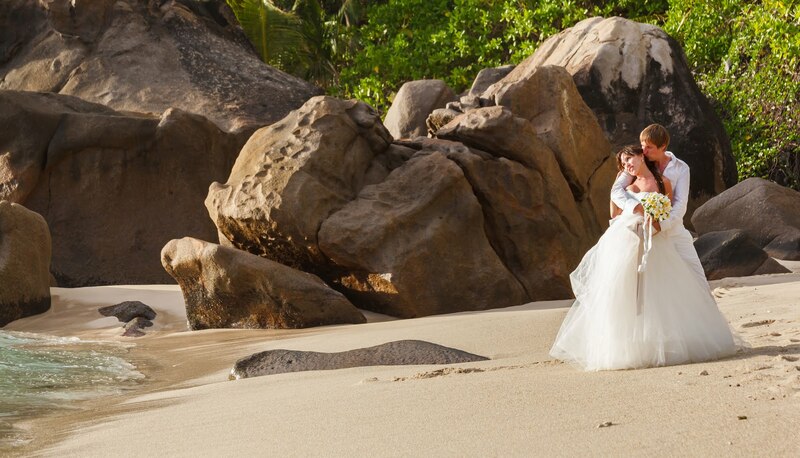 Perhaps let us arrange a twin-centre wedding and honeymoon trip, allowing you to combine your two dream locations? Nearly every travel brochure or website you can find will refer to their 'hand-picked' selection of hotels and lodges - but in our case it really is true! The wedding venues we offer are our close partners, some of whom we have worked with for nearly twenty years. Choosing from 5-star, and selected 4-star establishments, we guide you to the very best in creature comfort, customer service, facilities, cuisine and perhaps most importantly, attention to detail.